As this area of the forum has been a little slow lately, I thought it might be fun to discuss some of the more unusual pieces in our collections. Lets get some conversation started. Not the most inspired name of course: Knife of the Laz! I bet some of you guys have Laz Bichaq, or might at least want to talk about them? If so, don't hold back! Last edited by Gene Wilkinson; 05-21-2018 at 10:38 AM. There are many great photographs of the swords being worn. Also of the use of Kindjal/Qama by these warriors (top right). In the top left photo also notice the chap on the right has an interestingly modified Matini-Henry rifle. The stock has been replaced with a more local shape. Last edited by Gene Wilkinson; 05-21-2018 at 10:20 AM. Some have questioned the praticality of these over the years due to the shape of the hilt. However, unlike a Tulwar/Pulwar hilt, the hilt-horns of the Laz Bichaq don't interfere with it's handling or require a 'fixed grip'. The swords are light and fast and feel perfectly capable of a variety of cuts. Last edited by Gene Wilkinson; 05-21-2018 at 12:10 PM. OK People. Of the near 100 views no participation. If YOU want these sub sections of the forums to still be available when you want questions answered, then help to keep them active. Well - it's only been a day or so, and this particular weapon isn't what many here would consider "main stream" - so it could simply be that no-one who's looked at this thread has any useful information to contribute ? And rather than clutter the forum with random, off-topic posts, they're keeping silent ? This thread is just an encouragement to participate. The sub-forums are getting less and less participation. The first page in this sub-forum covers 16 months whereas the first page on the 'Antique and military sword' forum is full of threads from the last month or so (plus a few more 'stickys' I'll grant you). Is it 'clutter' if people add an encouraging comment to a thread? I myself often remark on swords outside of my interest. I don't have to actually collect that type to offer congratulations or make a comment. You are right, the Laz Bichaq isn't a mainstream sword. Which i why I posted it, to gather some interest. Even if that interest is from people who haven't seen one before. What I'd hope to see, is this encouraging people to start their own threads. Last edited by Gene Wilkinson; 05-23-2018 at 02:57 PM. Those are strange looking swords! With scabbards to match. Is it easy to draw the sword and to sheath it? It doesn’t look entirely practical. Great question. The scabbard is the strangest thing! It looks like it's going to cut through the apex of the curve or that the tip is going to catch. But as long as you 'wear' it as the warriors in the pictures show (with the edge up) it is held firmly enough by the scabbard to not move or slip in or out. But it can be drawn and sheathed smoothly. It's suprisingly well designed for a relatively short lived, but so 'unique' sword type! Some say that the design of the sword emulates the Garfish. The scabbard covering is also interesting. You can see the leatherwork that helped many to conclude that these are from North Africa. Also notice the binding? The main section of the scabbard is bound with a very thin strip of cotton material, which has been folded in half and impregnated with black paint in a similar way to 'Rexine' but of a more basic nature. The strips are wound onto the wooden base slightly overlapping. The impregnated surface provides water resistance. It was a very labour intensive process. I'm quite fortunate with this example that it even has the 'belt' strap. Last edited by Gene Wilkinson; 05-23-2018 at 02:47 PM. I'm suprised nobody has added their examples to this thread? What is the purpose of the hilt horns? Possibly use this end when someone comes unexpectedly from behind? There is so little concrete study of these beautiful swords. They 'seem' to appear quite suddenly and realtively recently, in a similar way to Kindjal but not quite as old it seems. We know them as 'Laz Bichaq' or 'Black Sea yataghan'. But perhaps a more accurate title would be to combine the two names: 'Laz Yataghan'. Now here is where I move into supposition. I think these are a Yataghan. I know that sounds like a truism, but what I mean is that the Laz dveloped there own unique style of short sabre based around Ottoman forms and came up with a Yataghan of such exaggerated form, that it is very nearly a Kopesh. For me, the usual horned hilt is just a reflection of this exaggeration of shape. The usual Yataghan hilt has 'ears', some have large and exaggerated ears. I've even seen Laz Bichaq with 'normal' Yataghan hilts like that! There is also at least one type of Yataghan with a multi-part 'T' shaped hilt (pictured). I think that wat we are seeing in the case of the Laz Bichaq is a distinct regional take on the standard Yataghan hilt. It has been suggested that the Laz Bichaq's shape emulates the Garfish, so I guess it could be argued that the hilt 'horns' look like a tail? It would also identify at a glance the owner as Laz. It's also said that the Laz were fierce pirates and this was their boarding sword. Gene, from what I know, certain types of clothing, weapons and armor etc worn by various semi soldiers / warriors have characteristics that visually identified the users culture or region etc to other people that they may come into contact with. As these men wore no uniform that could identify them, their equipment served this purpose. In the case of the laz, I think that it also was very identifiable to the people of that time period, were someone wearing one would be quickly identified. 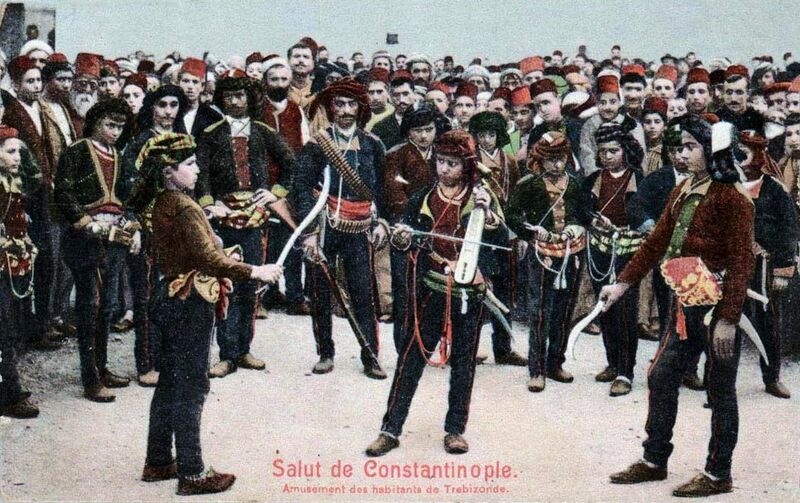 "Ottoman Laze, their territory, Lazistan, was part of the former kingdom of Pontus and the small Byzantine empire of Trebizond. Shown with a Black Sea yatagan (laz bichaq) and a rifle. From:Les costumes populaires de la Turquie en 1873, 74 photographic plates by Pascal Sebah, published by the Imperial Ottoman Commission for the "Exposition Universelle" of Vienna in 1873." Last edited by eric t; 06-07-2018 at 02:18 PM. Great close-up of that shot. Notice also that it's usually said that a feature of these is the overwrap 'rain cover' of the hilt. This isn't the only example of a period or near period photo showing one without, but you've made it the clearest. I agree, the sword makes the user immediately identifyable. Gene, I think you have to read more about the kingdom of Pontus and the Byzantine empire of Trebizond, its history and how the regions inhabitants responded to being forced into the Ottoman empire. As you noted, both the laz and kama were worn in later images. Was there an attempt to distinguish between certain tribes / regions etc or were these weapons a way to visually distance themselves from the Ottomans by purposely not carrying a yatagan. Was there an ambiguity / resentment about becoming muslim or an attempt to somehow retain / show their original origin without upsetting the Ottoman authorities? And yes, I need to read more, understand more and learn more. It was my (limited) understanding that the Laz people were relatively 'willing' additions to the Ottoman Empire? Of course there is an element of pragmatism in willingly submitting to a greater force and the net result may well be the retention of more of ones indigenous culture than might have remained had one resisted? Is the wearing of a visible 'badge' such as the 'Laz Yataghan' a show of defiance in subjugtion, or a show of individual pride as part of a collective? My own nation is sadly currently torn by similar questions. Do you think that perhaps what we are hinting at, is the reason why this sword seems to have 'suddenly' appeared? Could it be that the Laz people consciously 'created' this archaic form to preserve their individuality when absorbed into a greater empire? I know that I'm kind of repeating your observations. What do you think are the conclusions? Last edited by Gene Wilkinson; 06-07-2018 at 03:17 PM.